I tagged the like button because I appreciate the quote, but I have to say it does make me feel badly about myself. What kind of a storyteller am I? Is “beginner” allowed? How do you get to know the whole story if you don’t commit yourself to writing it down? The lifeblood of writing is the fierce opposition among techniques, opinions, theories, and practices, otherwise we’d all be writing the same stuff the same way. So thank you for bringing a very important point to the discourse. Notice that Irving is not talking about writing. He’s talking about storytelling – which is an animal of a different colour altogether. Storytelling is holistic, visionary, and the means for communicating from one mind to another. Writing is craft. It’s practice and it’s solitary. It’s the means of locomotion between the beginning and end of a story, but it isn’t storytelling. This difference is why I often say that writing well isn’t enough. 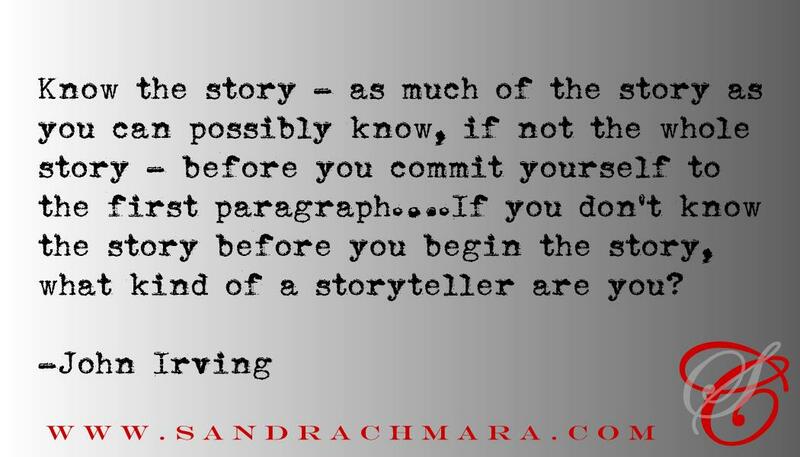 Writers must aim for storytelling, for the very reason Irving suggests in his quote. This goes way back through the oral tradition when there were no books, and travelling bards went from town to town reciting epics and engaging their audiences with powerful storytelling. Knowing the story you want to tell offers your writing that kind of authority. There’s no dithering your way into the reader’s heart. It means holding the reader by your skinny hand and glittering eye, and reducing him/her to a captivated three-year-old while you unwind your epic tale. Irving is saying that the vision of your fictional world must precede the writing of it, in the same way that you can’t start a business without a strategy – in other words, knowing what kind of enterprise you’ll be going into or what kind of product/service you want to offer – much less what you can bring to the game in order to make it work. Most important of all, though, is knowing how you’ll engage with your customer. The danger in starting a story before you have a vision and even a strategy for telling it is that writers can easily become stuck before they’ve even had much of a chance to dig in, the story can become bogged down in messy, unnecessary details, and even if a manuscript is finished, without understanding what pushes and pulls at the story – the telling part of it – it can lack energy, forward momentum, a sense of vitality, and purpose. So don’t feel bad about writing without an idea of where you’re going. We all do that. That’s where we build voice and style and technique. But if you want to engage in the act of storytelling, take the time to envision what kind of story you want the reader to take part in. Strategise it, even loosely, in your head so you can set your characters on the road toward the reader’s imagination. Take charge of the reader’s will. I understand now. Thank you for this. And the cheer to be the graybeard loon. I now love the grey-beard loon. It shall henceforth be my alter.